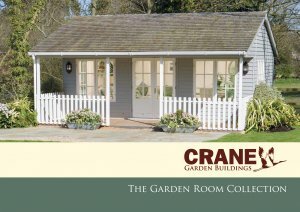 Our Garden Room features contemporary design elements and outstanding craftsmanship in every join. Every aspect is hand-crafted to order and can be tailored to your exact design specifications. 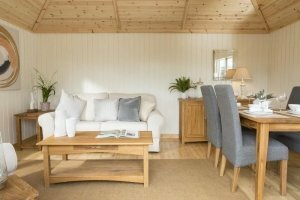 With full insulation and electrics, it is designed to offer year-round comfort and provides the perfect place for relaxation, hobbies, socialising and more. 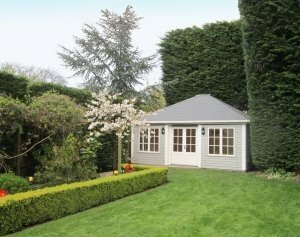 To create your own ideal Garden Room, please click on the Create My Garden Room tab below. 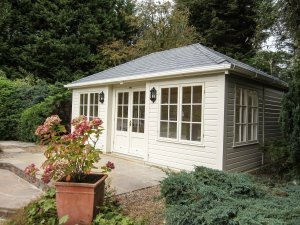 With our Garden Rooms, you can have double doors, an extra door set (on whichever side you want), inset doors, or a solid joinery door (if you have a storage partition as part of your design). You can also have an internal door to access another partition. 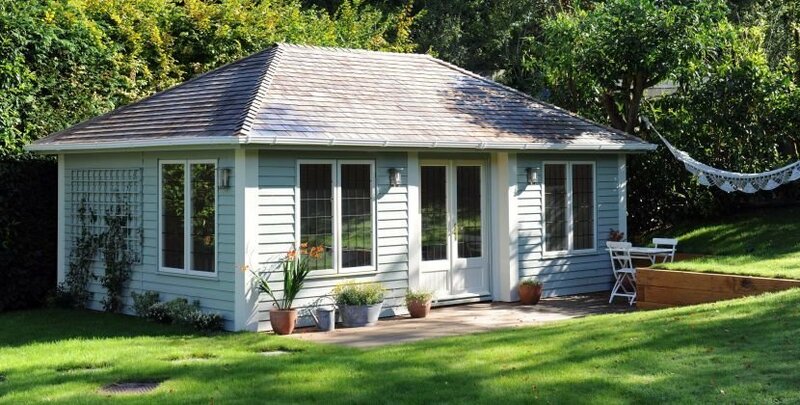 To afford a light and airy feel, our Garden Rooms come with 4 sets of windows. Corner boards can be added on as an extra to your order and are great if you're looking for that finishing touch to enhance your building with. 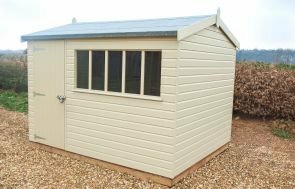 Guttering is included in the price of our Garden Rooms, but you can choose between white or black. 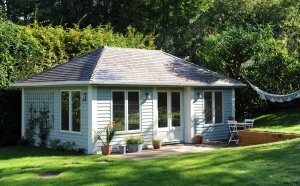 We can extend a hipped roof by an additional 100mm all the way round your Garden Room. This creates a different look for your building and additional protection for the walls. Height - 2.1m to eave height. Looking for a building with a veranda? Fabricated using only the finest FSC® certified timber, this hipped-roof Garden Room measures 14 x 20ft and has traditional Georgian windows. It was both delivered and installed by our expert, in-house fitting team as part of the exceptional service offered by Crane.